At an exclusive event at the Yamato Labs in Yokohama, Japan, which TechRadar attended, Lenovo marked the 25th anniversary of the announcement of the original ThinkPad 700C by revealing the ThinkPad Anniversary Edition 25, a retro-themed limited edition ThinkPad that takes a number of design cues from the original. The classic design includes nods to iconic features, such as the ThinkPad Classic keyboard, dedicated volume buttons, multiple status LEDs and multicolor logo. Not many brands in the computing world could play on its legacy in this way (in a similar fashion to how Nintendo released the NES Mini and SNES Mini retro consoles), and Lenovo is clearly relishing this chance. While the outside of the ThinkPad Anniversary Edition 25 has a decidedly old school feel about it, on the inside this is a thoroughly modern device, coming with an Intel Core i7-7500U processor and Nvidia GeForce 940MX graphics card. It also features a 14-inch full high definition display, 16GB DDR4 RAM, 512GB SSD storage and runs Windows 10 Pro. These specs are quite a bit different from the ThinkPad 700C, which was announced on October 5 1992, and came with a 25MHz 486 SLC processor, 4MB DRAM, and a 10.4-inch 640x480 screen. It originally shipped with either MS-DOS 5.0 or OS/2 2.0, though later versions came with Windows 3.1. The ThinkPad 700C was designed by Richard Sapper, based on traditional Japanese bento boxes, and was engineered in the Yamoto Labs in Japan. Since then, there have been 130 million sales of ThinkPad devices, with Lenovo acquiring the division and brand from IBM in 2005. Most ThinkPad devices retain design elements of previous models, such as the black chassis and red TrackPoint pointer. “ThinkPad design creates a powerful and synergistic relationship between form and function. It balances sophisticated aesthetics, thoughtfully crafted user experiences and renowned engineering in order to deliver superior products,” said David Hill, former Chief Design Officer, Lenovo. 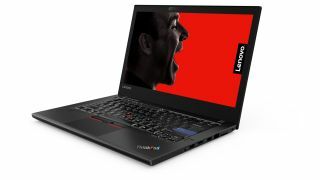 The ThinkPad Anniversary Edition 25 will be available to buy from today, for $1899 (around £1400, AU$2400), but numbers are likely to be very limited. Keep an eye out for further features about our time with Lenovo for the 25th anniversary of the ThinkPad, including exclusive interviews about the past, and future, of ThinkPad with some of the people behind the iconic machine. But how does the Lenovo ThinkPad compare to a MacBook Pro?